With the agreement of the Eurogroup to accept the Greek reform proposals the latest crisis in the euro area seems averted – for the moment. Apparently, Greece had no other option than to give in and prolong its current bailout program as requested or leave the monetary union. The latter would have been a complete surrender to the challenges of a common currency – not of Greece but of its European “partners”. All can-kicking in recent years, all refusals to face the needs of a functioning monetary system, all costly bank bailouts to prevent a destabilization of national financial markets and policy structures, and all sacrifices made by individual countries under harsh austerity constraints in order to “save the euro” might have been fruitless as a Grexit inevitably would have triggered a chain reaction among other member countries and possibly the union’s breakup. The danger is not banned yet: Gabriele Steinhauser (Wall Street Journal) wrote immediately after the official consent that the IMF and others still have concerns over the seriousness of the reform measures. Alkman Granitsas (Wall Street Journal) listed five things to know about Greece’s proposed reforms which its creditors might not expect or approve. And in order for the funds to be released the program must be implemented successfully and all its conditions met. How real is the risk of a Grexit under these circumstances? In principle, no one could force Greece to leave the eurozone. As Phoebus Athanassiou wrote in an ECB Legal Working Paper: “[W]hile perhaps feasible through indirect means, a Member State’s expulsion from the EU or EMU, would be legally next to impossible.” And voluntarily they would not go. Polls show that up to 80 percent of Greeks want to keep the euro. This is the dilemma Greek Prime Minister Alexis Tsipras is facing, as the NZZ noted the other day. On the one hand most Greeks were supporting his unbending attitude in negotiations with the Eurogroup. On the other hand, they want to keep the euro which, as almost everybody is telling them, would have been impossible if he had succeeded. The question is, however, whether in this special case the Greeks eventually could not both have their cake and eat it. 1. The country won’t ever be able to pay off its debts with austerity as Brendan Greeley (Bloomberg) argued convincingly and Michael Pettis explained in a more fundamental way. 2. A widespread fear of Grexit and currency conversion, which brings Greeks to withdraw cash from their banks and drives private capital out of the country, strongly limits the scope for policy action. A bank run is the greatest immediate danger. In what the Wall Street Journal called The Greek Re-Vote in February an estimated €2 billion (others talked of €5 billion) was leaving the country each week already. Maybe the prospect of an ever larger number of bank customers withdrawing their deposits and the resulting threat of bank illiquidity was the main reason for the U-turn of the Greek government accepting the Eurogroup deal in contrast to earlier statements. What would happen if Greece would run out of funds? Nikolaos Chrysoloras, Marcus Bensasson and Christos Ziotis (Bloomberg) described How a Liquidity Squeeze Could Push Greece Out of the Euro. In this case Greece would not only be unable to further service its international debt obligations. State and banks would no longer be able to adequately provide the economy with cash. Government would be forced to cut expenditures and also to establish a new currency to secure payments. Many would regard this as a first step to a de-facto exit from the euro area and a return to the drachma. But maybe there is still another option: New currency could be introduced in parallel to the euro explicitly for a limited time and a well-defined limited purpose with the intent to return to the status quo ante as soon as political and economic prospects do no longer cause panic and anxieties, confidence in the ECB’s lender-of-last-resort function is restored and capital flows are reversed. “The first step in this process would be for northern European countries to index all financial and real-economy contracts, as well as payments to and receipts from governments, to national inflation rates. This protects these countries’ residents from the effects of the ECB’s looser policy. Should inflation really kick up, however, the contracts could be redenominated in a new currency whose supply would be managed by a subsidiary of the stronger countries’ national central banks. 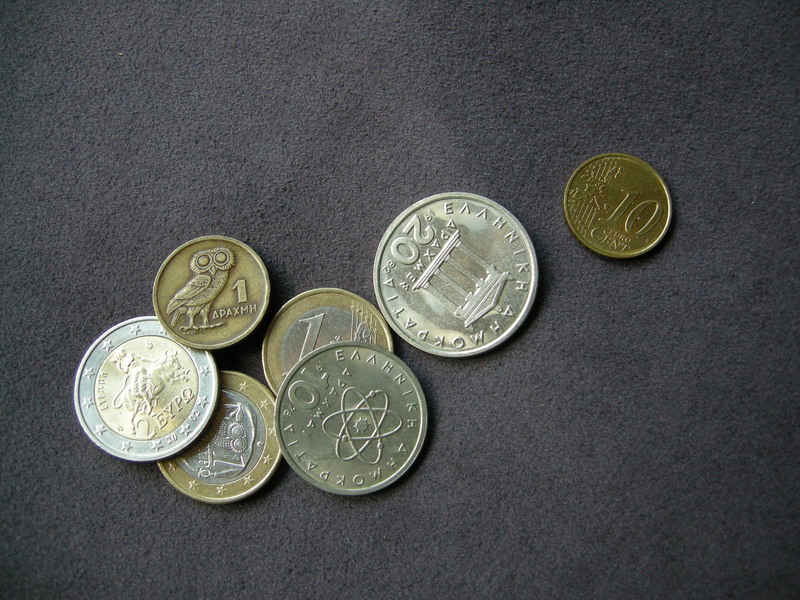 “Softening” the euro still might not be enough for countries like Greece, however. When external funding for these governments’ budget deficits eventually dries up, they could be made to issue IOUs to their domestic creditors. When these IOUs start to be traded, they could assume the role of a second parallel currency. But this currency would exist only as a means of transaction; the euro would remain as a store of value in the background. “[A] plausible response of the government to the shortage of euro cash as a result of the end of financial transfers would be to issue debtor notes (IoUs) to its creditors, promising payment as soon as fresh euro cash would become available. As creditors lacking euro cash would have to use the IoUs to settle their own bills, these instruments would assume the role of a parallel currency (let’s call it Geuro). The fixing of contracts and payments in a new currency with rapidly declining value is exactly what many Greeks fear. The mere announcement of such a policy would result in more cash withdrawals and capital flight driving the country ever faster into ruin. – any kind of new currency beside the euro would be held and dealt in entirely voluntarily. This is the concept of Notgeld (necessity money or emergency money) as it is known from history. There is a long tradition of emergency money in times of crisis. However, as noted by Iliazd in the introduction to a remarkable Flickr Notgeld album of over 5,000 mostly German notes “Notgeld was not the norm but the exception in the history of currencies” making it a sought-after collector’s item. “Notgeld (emergency currency) was issued by cities, boroughs, even private companies while there was a shortage of official coins and bills. Nobody would pay in coins while their nominal value was less than the value of the metal. And when inflation went on, the state was just unable to print bills fast enough. Some companies couldn’t pay their workers because the Reichsbank just couldn’t provide enough bills. So they started to print their own money – they even asked the Reichsbank beforehand. As long as the Notgeld was accepted, no real harm was done and it just was a certificate of debt. Often it was even a more stable currency than real money, as sometimes the denomination was a certain amount of gold, dollars, corn, meat, etc. It was not legal tender, so the only people who dealt in it were those that wanted to. It was very stable and debt free. To keep it flowing, sometimes it was set up to lose 2 or 3% of its value every month, which kept people from hoarding it. There were several advantages to issuing Notgeld. First, it stabilized local government and local markets, so people could sell and buy what they needed and government services kept functioning. Second, it was a stabilizing influence on the real currency, which was still used. And third, it helped to concentrate the real currency at the government level, so they could import things not found locally. The introduction of emergency currency beside the euro would allow the Greek government to flexibly react to a liquidity shortage, mitigate its effects and resume negotiations with its creditors under less pressure. In contrast to concepts of a parallel currency emergency currency would be created where it is needed. The spreading to many issuers would reduce the risk of default. Different conditions and denominations would secure the attractiveness in different circumstances. There must be innumerable disadvantages of this proposal to allow for emergency currency and I am looking forward to your comments on it. Surely, at first glance, the idea seems crazy. With several currencies in circulation economic processes risk to become more cumbersome, less efficient and less transparent. But, as Michael Pettis asked in a different context: Compared to what? The Greek economy is already in disastrous shape, its debt burden is choking any long-term economic recovery, it can never grow its way out of its debt no matter how radical and forceful the reforms, and a liquidity shortfall may put an abrupt end to any remaining illusion of the benefits of EMU membership. Examples of parallel currencies in and outside the euro area have shown that they can function remarkably well on a local level, promoting entrepreneurial initiative and stimulating economic activity. For Greece, fending off the immediate dangers, regaining control over its economic – and to some extent within existing restraints – monetary situation as prerequisite for long-term recovery should take precedence over all other political considerations. Maybe a crazy idea is what is needed now. IMO – how far the re-nationalisation in Europe has progressed, demonstrated by the fact that we speak of a crisis in Greece and not by a crisis in the euro zone. It is just as Ulrike Guérot said elsewhere, Germany is world champion in exports, however, the products made in Germany, are products of transnational cooperation. We should hone our eyes and pay attention to our wording. Dealing with the government debt crisis reminds me of dealing with patients, long talked the doctors of the kidney, the heart attack, the hip fracture – they forgot about the whole human being, forgetting that man is an organization with many parts, which can be seen as a whole. As well their is no different with Europe. As long as we can we should say: “Made in Europe” rather than “Made in Germany? So, the question you ask to allow an emergency currency can be answered by the way you will look at the problem as an local or an common problem. Should Greece be connected to a heart-lung machine so that it is viable again – would be this the solution or does we need change of our habits as a whole? There is an urgency asking for a short-term solution and principal questions we need a longterm strategy. Both have to be done – so it is also a question of inclusion – the emergency currency could be a solution but it’s not necessary the solution – without a political reform of the Eurozone there would be no progress.